Hello spring! I’m happy you’re here 😉 I love spring (every season has its own magic, so I see the beauty in every season), the trees come into bud then the flowers bloom. The colourful flowers and their smell make you feel better, you can have this spring mood in your interiors as well. I show you many ways how to style your rooms with floral pattern. Ready to refresh your home with flower-inspired furniture and pattern? Just scroll down and check out the wallpapers, rugs, fabrics, lamps, kitchen accessories, just to mention a few. And even a chair can add a floral joyful mood. For spring mood and floral decoration, the best way is to get some flowers. Take a look at these colourful flowers!!! This fenton & fenton interior is just perfect. This is the proof, how can you give life with colourful rugs and painting to a simple natural coloured room. Aaaaand don’t forget about the flowers! Perfectly elegant and also smells good 🙂 Be inspired by fenton & fenton. Flowers on your wall are very characteristic, so don’t use it all over your place, it could be bizarre. Cover only one wall or a corner with the pattern. Laurel kimono floral removable wallpaper by urban outfitters is inspired by a vintage kimono. I really like the harmony of blue and pink. Valeria Zaltron’s wallpaper Botanical Garden is manufactured by Londonart. The big detailed flowers are very decorative. Glamora’s design, White kusa is one of my favourite with its rose background and romantic flowers. E-Talking floral pattern is designed by Riccardo Zulato for Londonart, available in 3 colours. The motif is a nice combination of the geometrical and floral pattern. Whaaaaat? Flowers from concrete? Yes, I introduce you the gentle side of the concrete. Flaster by the Hungarian Ivanka is a concrete floor and wallcovering motive. The contemporary use of the material, the wide array of custom colours, the variation of small and large modules give endless possibilities for the designer to create a unique surface. Kaza concrete is another Hungarian company (we Hungarians are into concrete), they applied the simple and soft form of petals. These Petal tiles are the wallcovering in a Romanian spa. Iamart cement tile manufacturer plays with the motifs and colours. You can choose from 60 colours and many patterns. I am so lucky because I had an opportunity to create my own cement tile in their studio on Budapest Design Week 2017. Maybe you figured it out, they are also Hungarians. Read more about them in my Design Week summary. Canevas collection for GAN is designed by Charlotte Lancelot. She uses the traditional cross stitches to create a contemporary look. Eden queen from the Signature collection by Marcel Wanders is one of my favourites. Looks very good in their London showroom. Edward van Vliet’s Garden of Eden Light Grey is also part of the Signature carpets. From Russia with love | Scarlenka allover wrapped rug is designed by Jan Kath. The rug looks like a painting of gorgeous roses and luxuriant wreaths of flowers. Sonnen-pause outdoor fabric by Christian Fischbacher has a minimal floral pattern with petals. Available in more colours. Gartenfreund fabric is designed by Christian Fischbacher too. Photo-realistic flowers, butterflies and birds are printed on the fine cotton batiste. Kitty McCall’s All the flowers print in A2 size provides a happy atmosphere with its vivid colours for your home. The Megan Grant floral painting (right side of the photo) looks gorgeous with the fenton & fenton furniture. Ashley Woodson Bailey floral print features colourful petals in a beautiful way. Ali Wood artist has amazing still life and flowers paintings. This oil painting on wood is called Decisions made. Look at this wall with 4 paintings of Ali Wood. AMAZING! The wall is painted with “Spruce” shade by Haymes Paint. The Tokujin Yoshioka designed chairs for Moroso are called Bouquet. Looks totally awesome, it makes you feel sitting in a flower bed. Petal chair with double backrest by Skandiform imitates the petals of a flower. It’s also available with single backrest. Lemon blossom chair by Kati Meyer-Brühl resembles a blooming flower bud. Antibodi armchair and lounge chair by Moroso is designed by Patricia Urquiola. The lightly padded petals feature reversible materials. Three-dimensional geometry derived from the cellular genesis of sewn petals using the layout of a graphic structure with a triangular base. The motif of Polly floral print armchair is created by the urban outfitters textile team. Cappellini Juli Jubilee chair by Werner Aisslinger is upholstered with floral pattern. The main character of the Juli project is needle punching, an ancient craft technique allowing a very accurate pattern reproduction, guaranteeing the same accuracy of a handmade embroidery. Hive ottoman by Atelier Oï for B&B Italia. Hive means “beehive”, the complex structure generated by small elements. The three-dimensional surface was created from the assembly of small leather “leaves”, discarded from the manufacturing process. It took two years of work to perfect the final design. Ottomans accompanied by smaller tables will look like a flower and its leaves. Ukiyo low table by Kazuhiko Tomita for Moroso is a side table with a simple, red steel-wire stand which contrasts with the elaborate decoration of the Kimono fabric. The tabletops are decorated with the patterns used in kimonos. It’s inspired by Ukiyo, one of the most well-known cultural movements of the 18th Century. Related to Shintoist realism, which states that nothing can remain unchanged for long. From this perspective, no one can say whether the just bloomed flower will still be alive a moment later. Doriana Fuksas’ Desert rose lamp for Slamp is a “floral stone”. The elegant form levitates weightlessly. Megaflowers are from the Flowers collection by Hüttners. Create your unique chandelier by combining the “blooms”. On this floral print charger plate by Zara Home, every food will taste good. On this other with mini pink floral prints too. 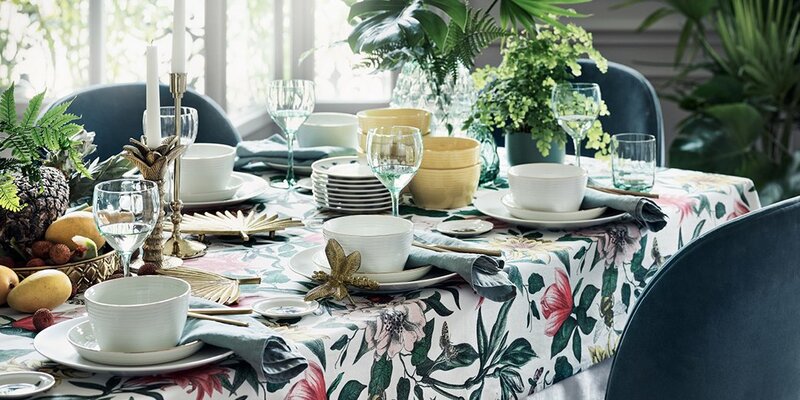 Floral patterned tablecloth by H&M Home is magnificent with its vivid colours. This other tablecloth by H&M Home is more sophisticated with its white background and floral patterns. Paint + petals melamine serving bowl designed by Bridgette Thornton is available on anthropologie. The fruits or any kind of food will look amazing on the colourful plate and bowl. Daniella floral comforter in Mauve and Cream Multi pattern by urban outfitters would like to invite you to bed. Enjoy your sleep with the flowers. Lillian Farag floral duvet cover is also amazingly beautiful, it could be a painting with the abstract floral pattern. Daniella floral shower curtain by urban outfitters will help you feel cleaner after a shower. Paradise floral print velour towel by Lands’end will dry up the water. Petal, flower, blossom, colour, sunshine. This is spring for me! I like colours, geometric and floral patterns in home decoration (and in clothes). BUT be aware where the limit is. Don’t try to cover everything with flowers, it would be too much. For example, a floral wallpaper and a lamp can work well together, but with a floral chair, the result would be excessive. Keep it simple like fenton & fenton. Sometimes less is more 😉 If you need advice, I am here for you! Ready for spring and floral? Pin and save the picture for inspirations.